This floor lamp does double duty offering a place for magazines and coffee cups, as well as additional light. Overall: 62" high. Tray is 23 1/2" high x 18" wide. Base is 15" wide. Takes one maximum 150 watt standard-medium base bulb (not included). On-off pull chain. Glass tray - shelf floor lamp from the 360 Lighting brand. Use as an end table or as a reading chair lamp. Black finish metal frame. White fabric drum shade up top. We want to replace a couple of dated lamps in our living room and bedroom. Great price, just what we needed. This met my needs for a combination of space saving, table top, reading lamp. Wish it had a 3-way switch but with the 150 watt bulb I believe I'll be pleased with my purchase. Good reviews and fit our needs. Need a table lamp for a small space. This looks perfect! Good reading lamp with 150 bulb and decent base to keep from tipping. It's perfect for next to my mom's recliner where she needs light but there's not enough room for an end table. It looks more sturdy than others I looked at. I hope I'm right! Perfect lamp for the space at the end of the sofa. Contemporary look. Modern design, fits in space available, I hope. It looks like it will work in a small space and price is good. Perfect size for guest bedroom. what is the fiber content of the shade -- linen? poly? BEST ANSWER: Hi - This includes a polyester blend lamp shade. thanks so much. this just saved me a lot of hassle for something I would have had to return. What is the weight of the lamp? Does it tip over easily? BEST ANSWER: It's fairly light, but I've had this lamp for two years sitting next to my couch and it has never tipped over (and I have two 80 lb dogs that bump it all the time when they're playing). The only thing I would recommend is getting extra foam pads that stick on the bottom to keep it from sliding. It comes with a few, but the stickiness does not last long. Otherwise, this lamp is wonderful! I don't know the weight of the lamp, but feels like it is between 10 and 15 pounds. I have it between two chairs so it is not easily bumped. I don't think it would easily tip, but if you have rambunctious pets or children it could happen. is it only on and off or can you use a 3 stage bulb? BEST ANSWER: Hi, the floor lamp does not have a 3-way socket. It is only on/off operation. Not sure. Ours seems to be only on and off. I really like the looks of the table and lamp combined. On-off only with a small pull chain on light bulb receptacle. 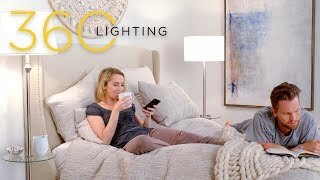 Does this lamp use led light bulbs? BEST ANSWER: Yes, you may use LED bulbs with this floor lamp. Yes, you can use an LED bulb with this lamp. Yes, you can use a LED bulb. Will a drum shade with an 8 inch depth fit? BEST ANSWER: Hi, an 8" inch shade will be too small for this floor lamp. The shade the lamp comes with is 10" high and 15" across. The brace for the shade is closer to the bottom than the top -- meaning that it attaches to the lightbulb and gear close to the bottom of the shade. If your shade is 8" and attaches at the top it will not fit. The arm of the lamp interferes. If your shade is 8" and attaches at the bottom, it will fit but the proportion will be off and it may look a little odd. Hope this helps. Thank you/ I appreciate the thorough response! Have had this item for three or four years and am very pleased with it. Can I purchase just a replacement shade for it from you? BEST ANSWER: Love to hear that you are still enjoying your lamp! You can indeed order a replacement lamp shade for this lamp. Below I have included the style number for the shade. Since it is a part order we will need for you to call in and place the order over the phone. BEST ANSWER: It has a linen finish that looks off white with the lamp off. With the LED bulb they sold me at LP turned on, the shade looks more creamy than white. The color of the light bulb really controls the color of shade with it on and the color of the room and ambient light with the bulb off. The shade is definitely white! Hi. the shade is white. It is a white shade. BEST ANSWER: This floor lamp has a white fabric uno drum shade that measures 15" wide x 10" high. This sits perfectly next to my entry door. There is a small nook by the front door and this lamp functions as the entry light and doubles as an end table and reading lamp. I searched months for something that would fit all of my needs. It was reasonably priced and provides a lot of light. I love the round glass table. You can store things underneath and on the table. Great for setting a drink down while reading. I couldn't be happier. Packaging was perfect.Prompt delivery. No hassles at all. This is a beautiful table lamp. The table part has plenty of room for my things. It doesn't weigh much, so it could tip over if you have small children or dogs running around. It looks so modern and the shade is a nice white color. lamp provides. It's extremely attractive, well-designed, and well-constructed. And...it was very easy to assemble. Very, very happy with it. In the door, down with the payment, and out with the merchandise. Simple and efficient. Even sold me the light bulb. This beautiful lamp and table keep my daughter organised at night. She loves to read in bed and the chain on the light makes it easy for her to switch the light off when she is tired. The table is a perfect size for books and a drink. The line of the lamp is clean and pleasant to the eye.One of the best purchases I have made. Super quick and easy to assemble. Thanks for a wonderful product at an excellent price. I needed something beside a recliner in living room to hold remote, drink, etc. This is perfect. Just the right size. A nice design. Great light for reading. A little too expensive for what you get, but it fits the bill for me. We dont have any end tables for our couch. This was the perfect compliment for our living room. Like the simplistic design and find it very functional. I love this lamp! It goes with my decor and it's just the right size for my space and very sturdy. It compliments the 2 loveseats I purchased, the table lamp is used on one end of a loveseat for reading purposes and to sit a coffee cup. Speedy delivery and well packaged to prevent damage. Exactly as described. Modern & simple! Needed height, compact design for corner of my bedroom. Loved it was a simple design. Goes great with all my black and white photos in my room. I neede a lmp with a tble that would fit in a corner behind a love seat -- this fits the bill! It provides great light and looks great,too! A pretty good lamp, I have it in a small corner area in basement so it's protected from getting bumped. I use the lamp as a reading lamp. The table is perfect for your favorite beverage. The clean lines make it suitable for any style. Great lamp for a great price. Perfect for small areas that could use a table as well. The single pull chain on the lamp is so easy. The glass table is perfect for setting items on. Love my table would recommend it!! It did not fit where I had planed but I found the right spot for it. I am very pleased. I love it! Easy to assemble. Great lamp combo to also have a place to set something down. Provided great customer service and product is all it was advertised to be. It lights up our life. Our living room is very large with no overhead lighting. This lamp/table between two chairs near the center of the room makes great lighting for the space. Two for one at a great price. May have to buy a second one. Came with white glass protector pads that looked cheesy. Used the black level adjustments instead. Worked great and you can't see them. Just as pictured. I plan to change out the shade for a nicer color. Like the lamp Would like it more with a 3 way bulb. Reasonable well made but very lightweight and good value. Easy to put together. Would have given it a 5 star rating but came bent where frame connects to light bulb socket. But, Lamps Plus sent another immediately & it was fine. Love the lamp. Lamps plus didn’t even ask for the bent one returned!!! I use this lamp between two recliners.